William Wordsworth, "To a Butterfly"
Butterflies abound in this picture! 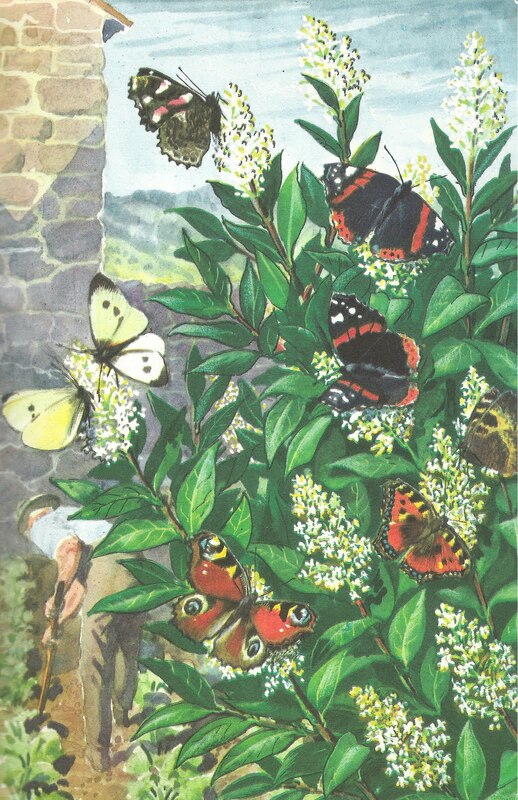 It shows a privet bush covered in butterflies from four species: red admiral, peacock, small tortoiseshell and large-white. An elderly gardener, no doubt vexed by the damage to his cabbages from the caterpillars of the large-white butterflies, is hoeing the weeds between his crops. What would summer be without butterflies? Poorer and less magical! And in the recent succession of wet, cold Summers we have had, I’ve sometimes wondered if our butterflies would ever recover. But this Summer, on hot days, I’ve seen some lovely butterfly-related sights. Admittedly, the best have been in Pembrokeshire on holiday, along hot, sheltered, sunny paths along the coast. Being in the Pembrokeshire National Park, there is perhaps less pesticide being sprayed and certainly both more beneficial habitat management and less intensive agriculture over a larger percentage of the land than elsewhere in our crowded and over-used country, which must be good for the butterflies (and the rest of Nature!). We also drove (slowly) through a big cloud of green-veined white butterflies which were sunning themselves on one of those steep ancient Pembrokeshire hedgerow banks, above Newport Beach, in Dyfed. We were back and forth a couple of times, and they were there all day. And my mother-in-law had five species of butterflies on her Buddleia bush at once at one sunny point during our holiday. We were also lucky enough to see Speckled wood and Comma butterflies everywhere in Pembrokeshire. But we also had a magical Scottish butterfly day in the sun last month, walking around Loch Kinord on Royal Deeside, where the grasslands around the loch were bursting with little blue or brown butterflies of various species, including the rare, and largely Scottish, Scotch Argus (you can tell from the name, can't you?! ), as well as peacock and red admiral butterflies. There were also thousands of little day-flying moths, the other side of our Lepidoptera natural heritage. That’s another story for another day though; today, we are on butterflies. Incidentally, while we are still on the subject of Welsh butterflies – lovely Welsh word of the day? Butterfly is “pili-pala” which, in our house, we pronounce as “pilly-pally” – not sure if that is correct? Maybe someone could let me know, but a lovely name anyway! The text for this picture says: “Throughout July, the privet bush is in blossom, and to its wonderfully sweet scent come many kinds of butterflies and other insects to sup at the rich supply of honey”. It isn’t the first time I’ve mentioned this but surely E.L. Grant Watson, the writer of the accompanying text, meant nectar rather than honey? Whatever, the privet bush here is covered in butterflies and it is always, always an amazing sight when a bush full of butterflies is encountered. These days, it is probably more likely to be a Buddleia (“butterfly bush”) that provides this spectacle. In this case, there are three red admirals at the top of the bush, two small tortoiseshell butterflies on the centre-right, a peacock butterfly at the bottom with its four “peacock eyes” visible on its wings, and two large-whites on the left (above the gardener in the picture). The privet is a garden plant, not native to Britain and, while it may well be growing wild in places, I’m not minded to spend any more time talking about it here. The fates of the populations of all of these species in Britain in the last few decades is revealed by Butterfly Conservation, the main conservation charity for butterflies and moths in Britain and Ireland. Butterfly Conservation published a report on the State of British and Irish butterflies in 2006, the information from which is also accessible in summary on their website here. The red admiral, small tortoiseshell and peacock butterflies are closely related species, member of the Fritillary family (Nymphalidae), and are all strong fliers. The red admiral (Latin name: Vanessa atalanta) is the black, white and red butterfly at the top of the bush (there are two with wings open and one with wings closed). The State of Butterflies report says that there has been an overall significant upward trend in the size of the red admiral population in Britain since the 1970s, of 350% between 1976 and 2004, with an increased range some 25% larger. There has also been a big increase in Winter sightings of red admirals, something that was a rare event in the 1970s and probably climate change-related. It seems to be making a transition from being a summer visitor to becoming a year-round resident species. Butterfly Conservation provides the following information: “Starting each spring and continuing through the summer there are northward migrations, which are variable in extent and timing, from North Africa and continental Europe. The immigrant females lay eggs and consequently there is an emergence of fresh butterflies, from about July onwards. They continue flying into October or November and are typically seen nectaring on garden buddleias or flowering Ivy and on rotting fruit... In Britain and Ireland the most important and widely available larval [caterpillar] foodplant is Common Nettle (Urtica dioica)”. The small tortoiseshell (Aglais urticae), possibly the favourite native butterfly of my Dad, who introduced me to the joy of butterflies when I was a small child and, other than the “cabbage whites” (see below), and also possibly the first butterfly I learned to identify (not least because it was probably the one (other than the whites) that I saw most often on the farming estate where I grew up. Although some concern was raised about the status of this species in the early 2000s, its abundance has really not changed significantly since the mid 1970s (1976, actually, when the monitoring began). It remains, according to the Butterfly Conservation report, “very common in Britain and Ireland, and was the third most widely recorded species in the 2000-2004 survey.” Butterfly Conservation also says: “The striking and attractive patterning, and its appearance at almost any time of the year in urban areas have made it a familiar species. It is one of the first butterflies to be seen in spring and in the autumn it often visits garden flowers in large numbers.” The “urticae” part of its name comes from the Latin name for nettles, the food-plant for its caterpillars. The third member of the Fritillary family shown here, the Peacock butterfly (Inachis io) has shown a long-term increase in its distribution, with a large increase in records north of the Firth of Forth in southern Scotland during the period 2000 to 2004. There was also a big appearance of Peacock butterflies in the Highlands in 2002, and the species appears to have colonised many areas of northern Scotland with, in 2004, the first sighting on the Western isles. Its range has increased by 17% between 1970-1882 and 2000-2004. The long-term trend in abundance is also upwards, an increase of +90% in Britain between 1976 and 2004, although in the last 10 years of that period, there was a shorter-term decrease of 40%. The Large-white butterfly (Pieris brassicae) belongs to another butterfly family, the Pieridae, commonly referred to as the “cabbage whites” – the Small White (Pieris rapae- not shown in the picture) may be the economically most damaging butterfly in the world, its caterpillars eating cabbages and other cruciferous crops world-wide. My main insect book, Michael Chinery’s “Insects of Britain and Northern Europe”, claims that the Large White is almost as bad, although not as widespread. Butterfly Conservation reports that there has been a small decrease in the range of this species since the period 1970-1982, and larger fall in population size at monitored sites since 1976 (-28%), with a smaller increase in the last 10 years. It is not, anyway, usually found in northern Scotland. I haven't seen a peacock butterfly for years, and red admirals only rarely since I was a child. I do get to see Common Whites and Small Tortoiseshells though, here in NE Scotland. I saw ringlets and gatekeepers at my mother's (Hampshire) earlier this summer, and also a blue. It was pretty small, but I'm not completely sure which kind it was.